The NFL’s Biggest Game, Letdown, Smack Down, and Surprise of Week 7? > News > The NFL’s Biggest Game, Letdown, Smack Down, and Surprise of Week 7? Week 7 in the NFL came to an end Monday night in Dallas as the New York Giants came from behind to take care of the Cowboys pretty easily. Not only did the Giants hand the Cowboys their 5th loss of the season, they took out Tony Romo early in the 2nd quarter when linebacker Michael Boley drilled Romo’s shoulder into the ground. The hit broke Romo’s collarbone and he is now expected to miss 6 to 8 weeks. The train wreck in Dallas continues to get worse as the Boys are now 1-5 overall and 0-3 at their 1.2 billion dollar home. Enough about the Cowgirls…now on to the biggest game, letdown, smack down, and surprise of week 7. The biggest game was no doubt, Brett Favre and his Vikings taking on the Green Bay Packers at Lambeau Field. 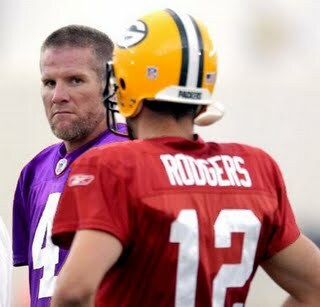 The Packers were looking for their first win over their former QB since he left the team 3 years ago…and of course, the boos poured in when Favre came onto the field. At that point, you knew this was going to be a showdown at Lambeau, which is exactly what it was. The Packers defense proved to be strong yet again as they forced Favre into 3 interceptions; however, it almost didn’t matter when on 4th down late in the forth quarter, Favre smoked a pass to the back of the end zone for a TD pass and a 30-28 lead…but the catch was reviewed and reversed due to the fact that only one foot was inbounds. The ball went back to the Packers and they ran out the time to get their first win over Brett Favre 28-24. The biggest letdown of the week goes to the New Orleans Saints. I mean were they not supposed to be one of the premier teams in the NFL?? Whenever anyone loses to the Cleveland Browns it should be a letdown…but the Saints? Now that’s a big letdown. Here’s what I think…the Saints were nobody before winning the Superbowl last year, and with the way things are going now, there going to go right back to being nobodies. Drew Brees had one impressive year, ended up winning the Superbowl, and now he’s Jesus? Who cares that he hit the goalpost upright on Dateline or whatever the hell that show was…throwing footballs at goal posts does not help you win Superbowls…dumb A. Anyway, good job Cleveland for getting a win over the Saints and for making them the biggest letdown of week 7 in the NFL. Final score, Browns 30. Saints 17. The biggest smack down of the week came when the Oakland Raiders absolutely smashed the Denver Broncos 59-14. I’ll give you that team name one more time…the OAKLAND RAIDERS!! How is that even possible?! Someone please tell me!! I know the Broncos are nothing special, but how a team that has sucked for years can put up 59 points on anyone is pretty freaking amazing. This was a game that the Raiders dominated from the 1st quarter on as they improve their record to 3-4. Can the Raiders build off this win? I guess we will see, but for now I’m going to go with probably not. My biggest surprise was the Carolina Panthers actually winning a game over the 49ers and joining the Dallas Cowboys, Detroit Lions, San Francisco 49ers, and the Buffalo Bills as the 5 suckiest teams in the NFL with only 1 or no wins on the season. Now comes the battle for last place and that #1 pick in the NFL Draft. Who can pull it off…who wants to pull it off? All I know is you expect this record from the Lions or the Bills, but now the Cowboys? I actually think it’s funny and it very well may be the curse of the Turkey? We all know how exciting football has become on Thanksgiving now…NOT!! This year for Turkey Day should no doubt be some exciting football when the Patriots thrash the Lions and the Saints stomp the Cowboys. Anyway, sorry for the bunny trail…good job Panthers and keep it up as you go for your 2nd win of the season this weekend against the St. Louis Rams. Well that’s all from me on week 7, but I would like to suggest you all check out the link below, as the Smack Pack travels to Foxborough, MA for their NFL key match-up and a special Halloween treat with Brett Favre.